Head Coach Dabo Swinney and members of the Clemson football team visited Joe DiMaggio Children’s Hospital on Monday afternoon in Hollywood, FL. 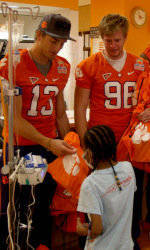 The Tigers that made the trip to the hospital were Stephone Anthony, Spencer Benton, Corey Crawford, D.J. Howard, David Smith, Tony Steward, Brandon Thomas and Dawson Zimmerman.